Cosmetic Cupcake: Swap with Alice from absolutely-alice! Time has just completely run away from me this last week leaving me barely enough time to complete the normal everyday things let alone leave me any time to enjoy myself! I've been polish-less for 3 days (OMG!) and today a patient asked me "Are you ok 'chelle? You don't seem yourself" whilst looking at my bare nails lol. It's kinda weird when people try to gauge what kind of mood I'm in by the state of my nails hahaha. Look at all the wonderful goodies!! 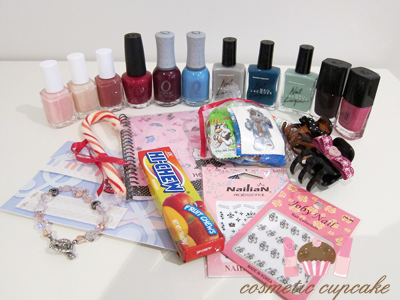 Alice - you included so many polishes from my wishlist eeeeeeeek! Thank you! Everything was wrapped so nicely that I didn’t want to unwrap the goodies! It only lasted about a minute though and then I ripped into it lol. How cute is the silver and white heart paper?? Essie Petal Pink, Pillow Talk and In Stitches. OPI Ali’s Big Break, Orly Thorned Rose and Snowcone. American Apparel Echo Park, Peacock and Office. 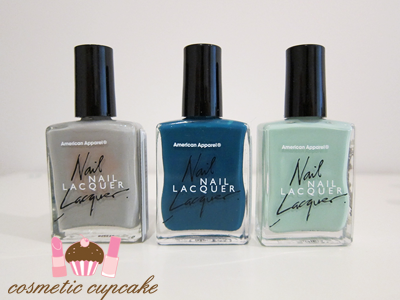 My 1st American Apparel polishes!! 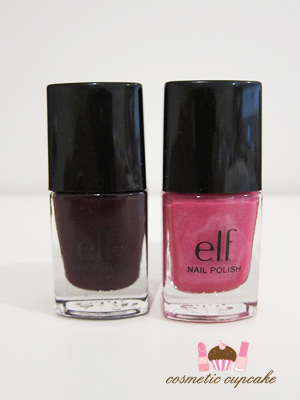 elf Plum and Berry Pink. So many wonderful extras and yummy treats! I've always wanted to try the Yes to Carrots range. The milk candies were delicious! Alice makes wonderful handmade items and she very kindly sent me some! 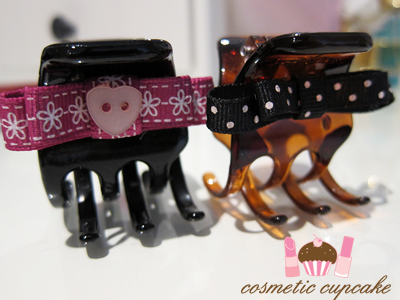 I love how she added the bows to make the hair clips more girlie. I now have even more bow accessories yay! 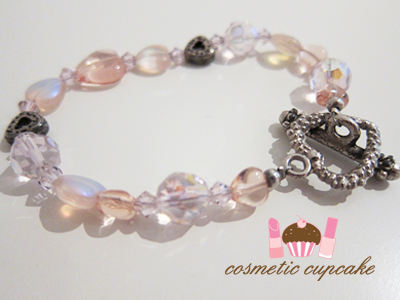 Alice hand crafted the beautiful bracelet below from rose quartz and it is EXACTLY the type of bracelet I would snap up for myself in a shop! I am in love with the heart detailing and the heart clasp. And it's pink yay! Thank you so much for swapping with me Alice! 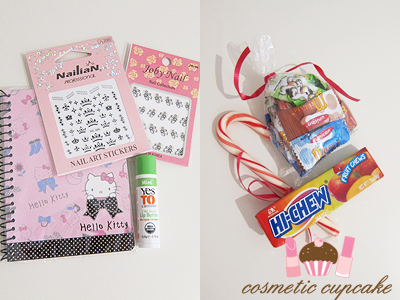 I look forward to our next swap =) Check out Alice's blog here! She does cute manis and has great tutorials for DIY projects. Please post more often Alice as I always enjoy reading your posts! I have so many wonderful polishes from all my swaps that I haven't tried yet so I'm determined to get my untrieds down to 1 helmer drawer before I am allowed to buy anymore nail polish. But that's going to have to start from Monday because I'm heading to the city tomorrow to take advantage of the Illamasqua amnesty woot! The Essies look beautiful :) I adore the bracelet too! Wow, you got a nice range of pretties! Wow! These look great! BTW, I just tagged you! Come check it out! wow what a lovely gift! Uwa that's another fabulous swap dear :D such a lovely nail polish selection. 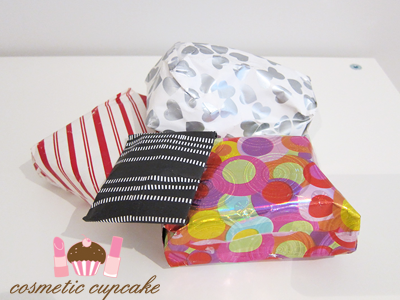 And so cutely packaged too, I would hate to tear open those lovely packages! That bracelet is very pretty, I too think that it matches your style perfectly! What a great swap! Those Essies look so delicate and pretty, I can't wait to see how you use them as I know it's bound to be beautiful. And that bracelet is stunning! I love how whimsical and pretty it is. I'm going to have to check my bead stash to see if I can make something similar! @Jennifer: Essie polishes are my absolute favourite when it comes to pretty, feminine colours. The bracelet is just gorgeous isn't it? @Freshie: I couldn't agree more! @*~ JuLiAnnE ~*: Thank you so much for tagging me Julianne!! @Alice: I LOVED everything Alice! Thank you so much =D I want to change my polish daily so I can try out all my untrieds but I don't have time to at the moment doh! @♥ c.angie ♥: Everything about swapping is heaps of fun! Thanks for stopping by and commenting hun! @Steph: I'm always so spoilt by the lovely ladies I swap with! I don't know which polish to start with haha. @Christina: I was trying to be careful to not tear the paper but in the end I just ripped into it hehe. It's scary that Alice got my style down to a t! Lol. @Danielle: You are so sweet Danielle =) I'm trying to think how I'll use all these new colours! Hope you have some beads similar so that you can make something similar. Whimsical was the word I was looking for to describe the bracelet! @나니 : No worries I'll swatch them! I'm not sure when though as I have so many polishes to try but do check back! great swap! loving the nail polishes!! !